Here are some snazzy birthday facts about 1st of March 1971 that no one tells you about. Don’t wait a minute longer and jump in using the content links below. Average read time of 10 minutes. Enjoy! What day was my birthday Mar 1, 1971? March 1, 1971 was a Monday and it was the 60th day of the year 1971. It was the 9th Monday of that year. The next time you can reuse your old 1971 calendar will be in 2021. Both calendars will be exactly the same! This is assuming you are not interested in the dates for Easter and other irregular holidays that are based on a lunisolar calendar. There are 317 days left before your next birthday. You will be 49 years old when that day comes. There have been 17,581 days from the day you were born up to today. If you’ve been sleeping 8 hours daily since birth, then you have slept a total of 5,860 days or 16.04 years. You spent 33% of your life sleeping. Since night and day always follow each other, there were precisely 595 full moons after you were born up to this day. How many of them did you see? The next full moon that you can see will be on April 19 at 11:14:00 GMT – Friday. Fun stat: Your first one billion seconds (1,000,000,000) happened sometime on November 7, 2002. If a dog named Maysey - a Scottish Deerhound breed, was born on the same date as you then it will be 267 dog years old today. A dog’s first human year is equal to 15 dog years. Dogs age differently depending on breed and size. When you reach the age of 6 Maysey will be 45 dog years old. From that point forward a large-sized dog like Maysey will age 5-6 dog years for every human year. Sweden introduces its own Swedish calendar, in an attempt to gradually merge into the Gregorian calendar, reverts to the Julian calendar on this date in 1712, and introduces the Gregorian calendar on this date in 1753. Marshal F. S. López dies during the Battle of Cerro Corá thus marking the end of the Paraguayan War. The U.S. government releases the unencrypted text of the Zimmermann Telegram to the public. W47NV begins operations in Nashville, Tennessee becoming the first FM radio station in the U.S.
American Airlines Flight 1 crashes on take off in New York. Provisional Irish Republican Army member Bobby Sands begins his hunger strike in HM Prison Maze. The International Criminal Court holds its inaugural session in The Hague. What does my birthday March 1, 1971 mean? Your birthday numbers 3, 1, and 1971 reveal that your Life Path number is 4. It represents growth, building and foundation. You are practical, down to earth with strong ideas about right and wrong. The following celebrities also have the same life path number: Claire Bloom, Chris Smither, Katie White, Stephanie Szostak, J. Madison Wright Morris, Felicia Brandström, Kim Kardashian, Kimberly Dos Ramos, Ryan Eggold, Fernando Tejero. What is the birthday horoscope for Mar 1, 1971? The Western zodiac or sun sign of a person born on March 1 is Pisces ♓ (The Fish) – a mutable sign with Water as Western element. The ruling planet is Neptune – the planet of dreams and imagination. According to the ancient art of Chinese astrology (or Eastern zodiac), Pig is the mythical animal and Metal is the Eastern element of a person born on March 1, 1971. Fun fact: The birth flower for 1st March 1971 is Jonquil for affection. What is the Love Match for Mar 1, 1971? When it comes to love and relationship, you are most compatible with a person born on January 21, 1997. You have a Love Match compatibility score of +158. Imagine being in love with your soul mate. On the negative side, you are most incompatible with a person born on April 19, 1955. Your incompatibility score is -115. You’ll be like a cat and a dog on a love-hate relationship. Arf-arf, I want to bite you. Meow-meow, stay away from me! The number-one hit song in the U.S. at the day of your birth was One Bad Apple by The Osmonds as compiled by Billboard Hot 100 (March 6, 1971). Ask your parents if they know this popular song. How many babies were born on March 1, 1971? Base on the data published by the United Nations Population Division, an estimated 121,818,445 babies were born throughout the world in the year 1971. The estimated number of babies born on 1st March 1971 is 333,749. That’s equivalent to 232 babies every minute. Try to imagine if all of them are crying at the same time. What is the popular baby name on 1 Mar 1971? 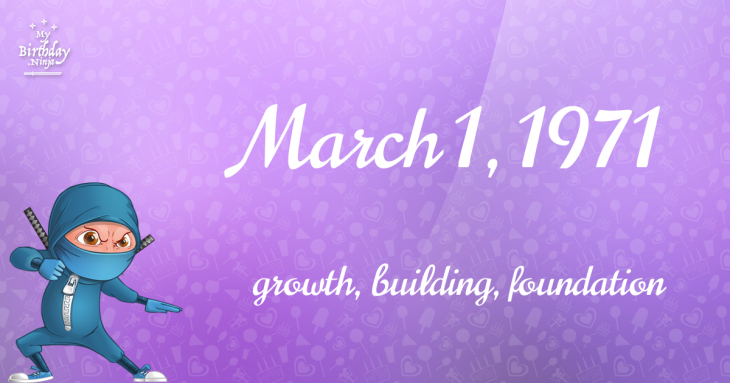 Here’s a quick list of all the fun birthday facts about March 1, 1971. Celebrities, famous birthdays, historical events, and past life were excluded. 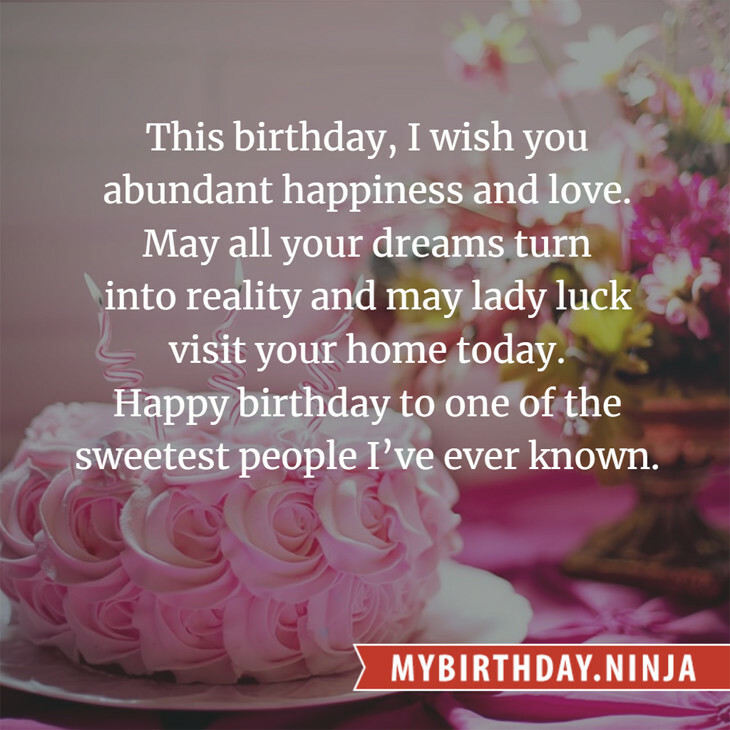 Try another birth date of someone you know or try the birthday of these celebrities: April 29, 1982 – Aksana, Lithuanian-American wrestler and model; April 29, 1991 – Cole Vosbury, American singer-songwriter; August 10, 1956 – Peter Robbins, American actor.